Five different Easter Treats that are easy to make and delicious to eat! Treats are put in a snack-size ziplock bag with FREE printable bag toppers included. If you’re looking to make adorable Easter Treats for friends, family, neighbors, etc. this is your one-stop shop of inspiration! 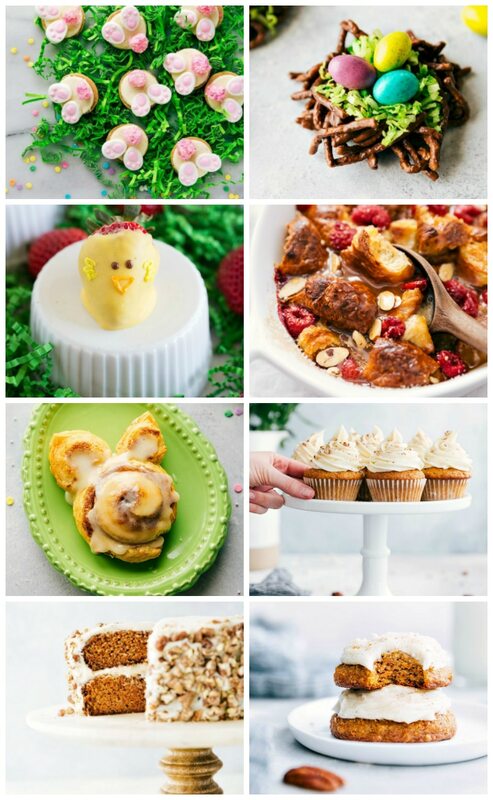 Five different treat ideas with individual bag toppers, plus more inspiration and links to other delicious Easter treats below. 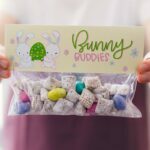 I’ve also included a recipe for a simple (10 minute prep) Easter muddy buddy snack mix which is always a crowd favorite. Don’t want to print or cut these out? Buy high quality printed and cut out toppers here. Print the bag toppers on glossy card stock paper for best results. To make cutting and folding the printable MUCH easier, use a good Paper Cutter and a Scoring Board. Zip-loc has the nicest looking snack-size resealable bag, but any snack-size resealable bag will work. Fill up the snack-sized bags with graham crackers, marshmallows of choice, and mini chocolate bars. Cut out, score, and fold the printable over the filled bag. Staple each side and these Easter treats are ready to gift or decorate with! 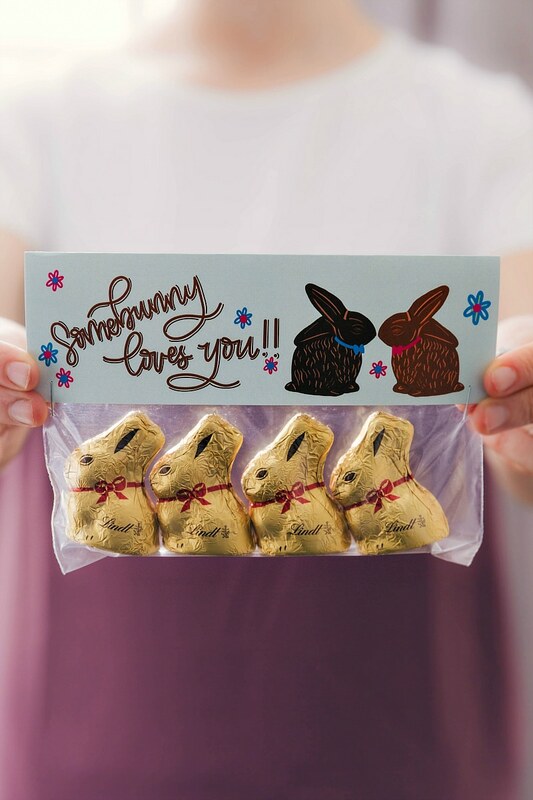 Fill up the snack-sized bags with chocolate bunny candies/snacks of choice. Cut out, score, and fold the printable over the filled bag. Staple each side and these Easter treats are ready to gift or decorate with! 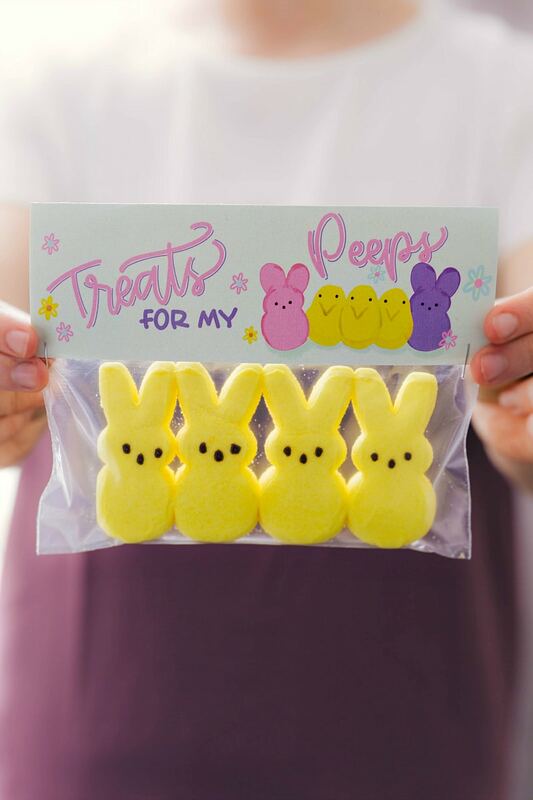 Fill up the snack-sized bags with peeps marshmallows. Cut out, score, and fold the printable over the filled bag. Staple each side and these Easter treats are ready to gift or decorate with! 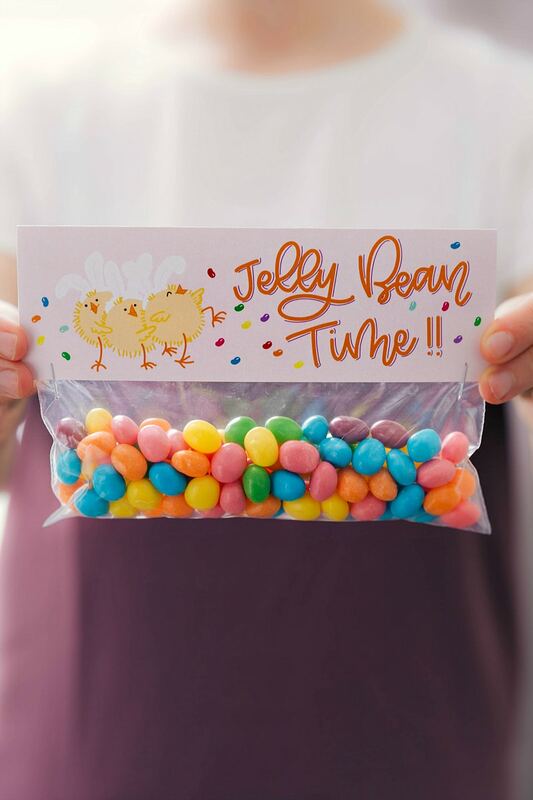 Fill up the snack-sized bags with jelly beans. Cut out, score, and fold the printable over the filled bag. Staple each side and these Easter treats are ready to gift or decorate with! 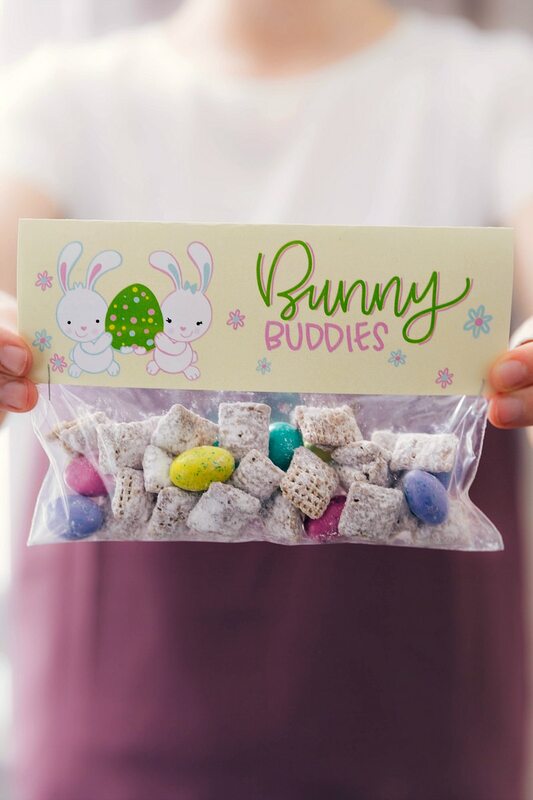 Fill up the snack-sized bags with several handfuls of the bunny buddies. Cut out, score, and fold the printable over the filled bag. 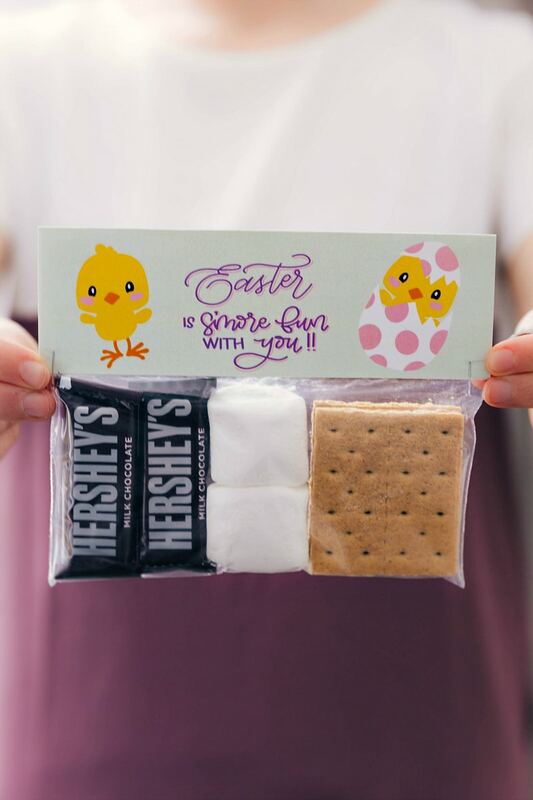 Staple each side and these Easter treats are ready to gift or decorate with! In a large microwaveable safe bowl, combine the peanut butter, chocolate chips, and butter. Microwave in bursts of 15 seconds, stirring in-between each burst for 15 seconds, until the mixture is melted and smooth. Add in the vanilla and salt. Pour over the prepared cereal. Stir well until the cereal is evenly coated. Pour half of the cereal mixture into a gallon-sized ziplock bag and pour half of the powdered sugar over it. Seal and shake until the cereal is evenly coated. Repeat with the other half of the cereal and powdered sugar in the same or a different bag. Shake until all the cereal is well coated! Remove into a large bowl and stir in Spring colored M&Ms. Separate into individual snack size bags and attach free printable bag topper! Alternatively: store leftover muddy buddies in an airtight container at room temperature. These are all such cute ideas! Thank you!